Damalie is a single mother of four, who lives with her family in Iganga, Uganda, where she sells vegetables and fruits for a living. 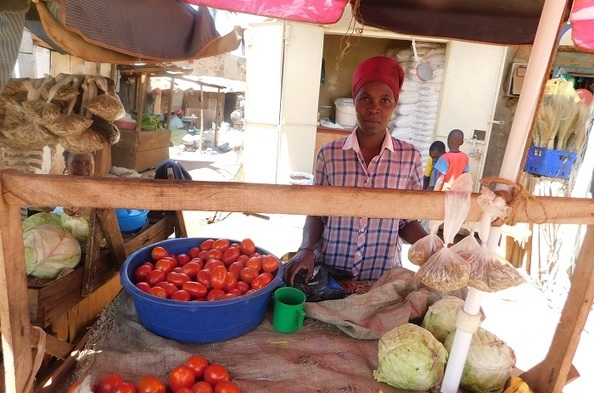 Her biggest challenge is that her small income goes directly to supporting her family and paying for her children's school fees, leaving nothing to reinvest back into her business. Damalie has struggled to grow her business and was worried she would never be able to help her family improve their financial situation. One day she met an Opportunity International employee who told her about the programs and services that were available to her. She knew this was the solution she had been hoping for. Damalie used her loan to purchase a wider variety of items to sell in her store, resulting in increasing profits and a stronger sense of financial stability. She is able to pay her children's school fees, provide for their daily needs, and pay her rent on time. She has even begun to save for the future! Damalie dreams of expanding her business even more, and constructing rental units to diversify her income and ensure her children's school fees are covered up to the university level.